Charles Dickens loved magic and the art of conjuring. He is believed to have regaled children with rib-tickling magic tricks at his Twelfth Night parties in London. In 1849, the famous British novelist gave a performance as an eccentric magician in a tiny village on the Isle of Wight. The show was billed as “The Unparalleled Necromancer”, and Dickens called his magician’s avatar Rhia Rhama Rhoos. To convincingly disguise himself as an ‘eastern conjurer’, Dickens had painted his face with boot polish, sported a turban and was decked out in silk robes. The name Rhia Rhama Rhoos was inspired from Khia Khan Khruse, who called himself The Chief of the Indian Jugglers. He was supposed to be the rival of Ramo Samee, considered the first Indian juggler and magician to gain celebrity status in the west in the 19th century. Although Ramo Samee (a corruption of the name Ramaswamy) was a bona fide Indian export, Dickens then did not know that Khia Khan Khruse was a Portuguese by the name of Juan Antonia. In fact, so pervasive was this trend of western magicians aping and competing with their Indian counterparts in the 19th century—popping up as they were as the fakir of Ava, fakir of Oulu, fakir of Simla or fakir of Jeypoor—that author and journalist John Zubrzycki has an entire chapter dedicated to these cross-dressing magicians in his book Jadoowallahs, Jugglers and Jinns: A Magical History of India. Zubrzycki’s tribute to Indian spell-casters, from the sorcerers found on Mohenjodaro seals to the rise of P.C. Sorcar Sr, brings forth an eclectic cast of characters skilled in the techniques of illusion-making. He mines annals of Indian magic lore—the fantastical accounts of Chinese and European travellers, references from ancient Indian philosophy, occult practices, folklore and legends—to breathe new life into a waning genre of popular culture. While the exuberance and stage panache of Sorcar Sr is much written about, the book vividly portrays other unfamiliar wonder-workers. Attached to the royal darbar of Charkhari in central India was a court magician of ‘modern’ vintage in the late 19th century. This drawing room magician was popularly known as Professor Ahmad, born as Mirza Ahmad Husain in 1869. Drawn to magic from the time he found a sovereign inside a Christmas pudding, Professor Ahmad quickly excelled in slipping in money into hot rolls and buns, and watches into cakes and bread. 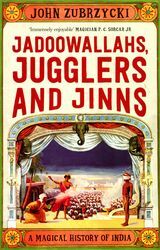 Zubrzycki, who had worked as a foreign correspondent in India, has steered clear of orientalist stereotypes to strictly focus on the role of magician as an entertainer. Even so, the book breathlessly attempts to gobble more than it can swallow in less than 500 pages.